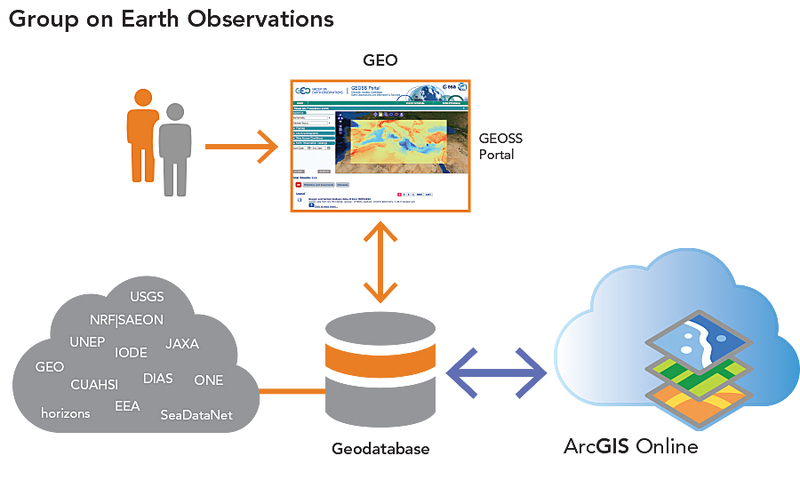 Esri joins GEO's effort to broker earth observation data. MOU between Esri and Italy National Research Council improves platform functionality. 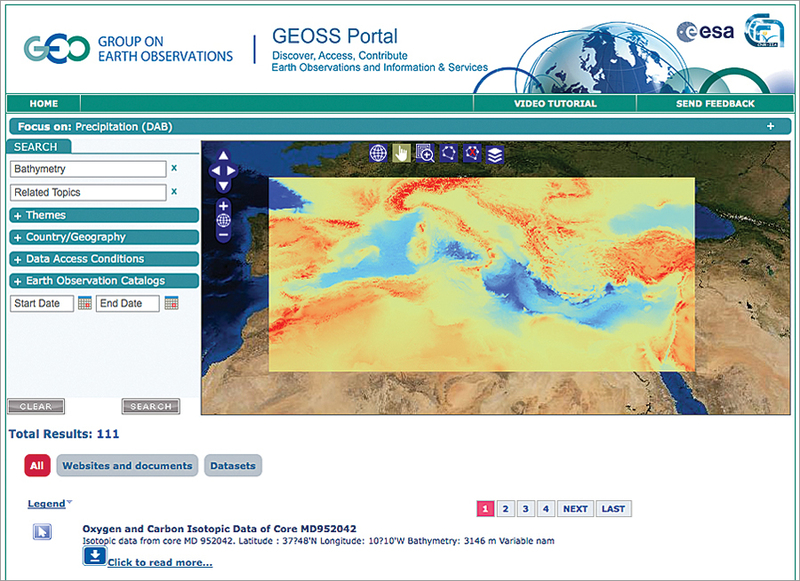 GEOSS categorizes earth observation data into nine societal areas: sustainable agriculture, biodiversity conservation, climate change and its impacts, natural and human-induced disasters, ecosystem management, energy management, environmental sources of health hazards, water resources, and weather forecasting. Millions of Esri's GIS customers whose work intersects these societal areas will find GEOSS data directly applicable to their projects. They can use it to establish baselines, monitor change, analyze problems, and design solutions. "GIS becomes a platform for understanding when people use it to build on top of existing knowledge and measurements and share new ideas," Esri president Jack Dangermond says. "We are trying to create understanding out of measurement, knowledge, and science so that people can act. These measurements provide the basis for interpreting science for design work such as land-use planning." One path starts from an Esri portal and leads the user to discover the main systems of services provided by GEOSS. ArcGIS Online users will access networks brokered by GEOSS DAB, such as the Committee on Earth Observation Satellites (CEOS), the International Council for Science (ICSU) World Data Center PANGAEA, the National Aeronautics and Space Administration (NASA) Global Change Master Directory (GCMD), and the World Meteorological Organization's Information System (WIS). "I have often called GIS a platform for understanding," Dangermond says. "People use geographic measurements to create knowledge and take action. GEOSS serves as an earth measurement platform for monitoring change on the planet. Making GEOSS content available in ArcGIS Online increases opportunities for scientists and other communities to visualize information in greater context. Moreover, because the platform supports authoritative and crowdsourcing information, GEOSS members can build networks into other disciplines." "Basically, GIS takes different layers of information or scientific measurements and integrates them analytically, visually, and/or dynamically into various forms," Dangermond explains. "Fusing the platforms sets up a work environment to access data and information sets, see them in context with GIS, and use them for modeling or in various applications." 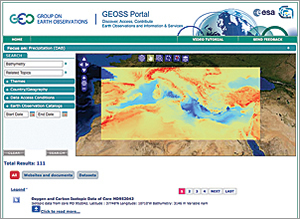 The GEOSS and ArcGIS Online service is unique. One reason is because GEOSS and Esri's relationship diverges from the traditional scientific relationships between government and public agencies. Since ArcGIS Online is operated by Esri, a private company, it has more flexibility than platforms offered by government-driven or single government initiative programs. Furthermore, ArcGIS Online holds shared geospatial and imagery data of the entire planet rather than for a specific region or area of interest. Data available in ArcGIS Online does not belong to Esri. Rather, the data belongs to hundreds of thousands of organizations that choose to share their basemaps and other kinds of information via the platform. Esri customers are but one of the communities that GEOSS brings together. It connects atmospheric and biodiversity, as well as many other sciences. Bringing GEOSS data into ArcGIS Online will help these communities extend their scope and work together to meet some of earth's critical challenges.